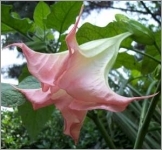 Datura stramonium, the Thornapple or Devil's apple, is a plant that gets about 2 or 4 feet tall with a similar spread. It is a common in pastures, barn yards, roadsides and waste places throughout the US, southern Canada, and most of the world. Some believe it may have come originally from Asia. Today it occurs almost everywhere. Normally treated as an annual, the plant can be over-wintered in a greenhouse environment. The flowers are white or pale lavender, shaped like a five-sided funnel, 2-4 inches long. 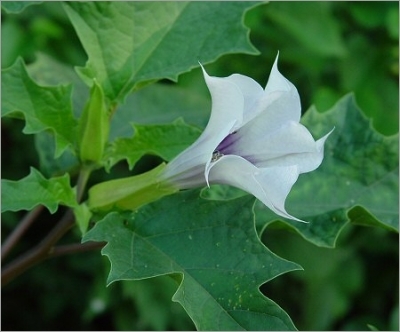 The long delicate trumpet shaped flowers are attractive and fragrant. They open for only one evening to the morning, but new ones continue to open throughout the Summer and Autumn, from July to September. The flowers are followed by the spiny seedpods, which give the plant its common name Thornapple. The fruit is about 2 inches long, egg-shaped and covered with spiny prickles. It starts out green and ripens to brown. It is full of black seeds. Remove seedpods regularly to encourage further blooms. The stem is much branched, forked, spreading, leafy, and of a yellowish-green color. The leaves are from the forks of the stem, large, to 8 inches long, ovate, smooth, unequal at the base, variously and acutely sinuated and toothed, veiny, dark-green above, and paler beneath. All parts of plant are poisonous if ingested.